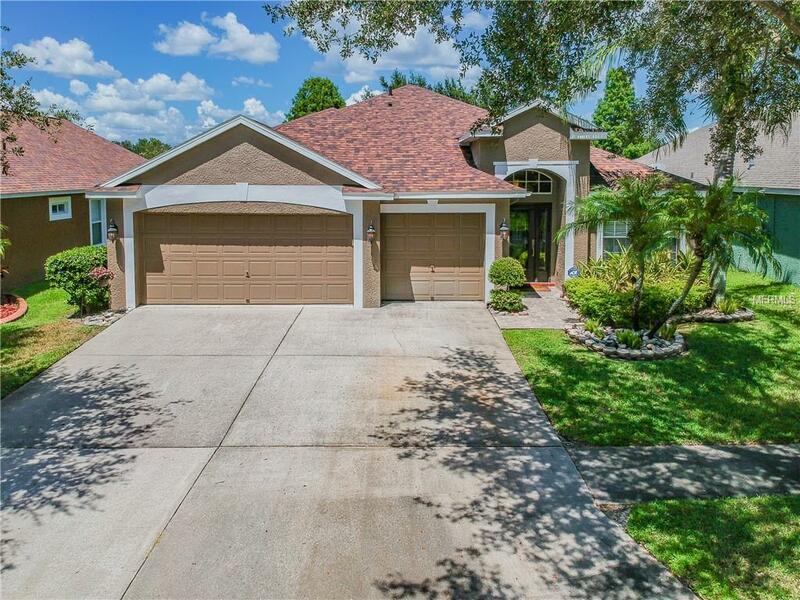 AMAZING OPPORTUNITY for this meticulous maintained and TASTFULLY UPDATED 4 bedroom 2 bath 3 car garage single family home in WESTCHASE! This lovely home is nestled on a PREMIUM LOT with extraordinary POND VIEWS. Upon entry, you are greeted with brand new rich HARDWOOD FLOORS that extend from the formal living and dining areas through the family room. The kitchen boasts GRANITE COUNTERS and STAINLESS STEEL APPLIANCES. The VOLUME CEILINGS coupled with an abundance of windows provide great NATURAL LIGHT. The triple POCKET SLIDERS enable you to combine indoor and outdoor space seamlessly perfect for entertaining or just enjoying a cool evening! The lanai is completely screened and extended. All 4 SPACIOUS BEDROOMS also feature new flooring. The master bathroom has a NEW DOUBLE SINK VANITY, GRANITE COUNTERS, GARDEN TUB, and separate shower. This home has been painted inside and out. Additionally, this home features a NEW ROOF with a 10 transferable warranty! This home is turnkey! Walk or bike to Westpark Village for an abundance of community events, restaurants, shops, entertaining and more! Westchase is one of Tampa's premier GOLF communities, with 2 COMMUNITY POOLS, tennis courts, basketball courts, playgrounds, and parks. Just minutes to schools, Westfield Citrus Park Mall, Tampa Airport, medical facilities, convenient access to Downtown Tampa, and the Gulf Beaches. With the Veterans Expressway nearby, you can be anywhere in town in minutes. Call us today to schedule your tour!